Department of Hepatology and Gastroenterolog,. Charles nicolle’s hospital. Tunis-Tunisia. *Address correspondence and reprints request to: Khouloud Bouslama, Department of Hepatology and Gastroenterolog,. Charles nicolle’s hospital. Tunis-Tunisia. Bouslama K, Houissa F, Rejeb MB, Bouzaidi S, Moualhi L, Mekki H, et al. Malignant Epithelioid Hemangioendothelioma: A Case Report. Oman Med J 2013 Mar; 28(2):135-137. Malignant epithelioid hemangioendothelioma (EH) is a rare tumor of vascular origin. We report a case of a woman who was found to have multiple hepatic masses in the right lobe of the liver on radiologic investigations, initially misdiagnosed as a metastatic carcinoma. 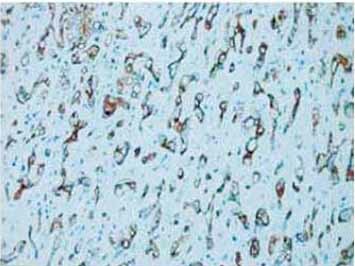 The diagnosis of EH was made on histopathological study and confirmed by immunohistochemistry, which showed diffuse response for CD34 marker and no response to tissue CEA, HMB-45 or S-100 protein. Partial hepatectomy was made with good results. Keywords: Epithelioid; Liver; Histopathology; Immunohistochemistry. Epithelioid hemangioendothelioma (EH) is an uncommon low-grade malignant tumor of vascular origin that may develop in the soft tissue, lung, bone, brain, liver, and small intestine. Primary hepatic EH is rare.1 In the literature, approximately 200 cases have been reported. The diagnosis can be made both on cytology as well as on histology. Liver transplantation appears to be the only hope for patients with hepatic EH because of the multifocality of the tumor.1,2 We report a case of EH diagnosed on histopathological study, confirmed by immunohistochemistry, which shows diffuse response for CD34 marker and treated by a partial hepatectomy with good results. A 49-year-old female presented with a four-month history of abdominal pain and weight loss. She was a non-alcoholic, non-smoker with no co-morbid medical or surgical ailment. There was no use of oral contraceptives and no chemical exposure. Physical examination showed abdominal tenderness on the right side of the abdomen. Systemic examination was unremarkable. Routine hematological and biochemical investigations, including serum bilirubin, transaminases, alkaline phosphatase and proteins were within reference ranges. Serological tests for hepatitis B and C were negative. Serum carcinoembryonic antigen, CA 19-9 and alpha-fetoprotein were also normal. Colonoscopy and upper endoscopy were normal. Figure 1: Computerized tomography scan of abdomen showing hepatic nodule. Computed tomography guided needle core biopsy from the voluminous nodule was taken and processed for histopathological study. On light microscope, the section shows polygonal epithelioid tumor cells with abundant vacuolated cytoplasm, vesicular to hyperchromatic nuclei and prominent nucleoli. Immunohistochemistry revealed the tumor cells to be strongly and diffusely positive for CD34 (Figs. 2 and 3). The tumor cells were negative for carcinoembryonic antigen, HMB-45 and S-100 protein. Hence, a final histologic diagnosis of hepatic EH was made. The surgical procedure consisted of a right hepatectomy in order to insure complete tumor removal. At the last follow-up (2 years after diagnosis), the patient appeared well with no recurrence diagnosed on the remaining liver. Figure 2: Histopathology of EH (H&E × 200). Figure 3: Immunohistochemistry of EH revealing diffuse response to CD34 marker (CD34 × 200). Epithelioid hemangioendothelioma is a distinctive vascular tumor occurring mostly in soft tissues of extremities and lungs.1,2 Involvement of liver may be seen as a metastasis or rarely as a primary tumor.3 Primary hepatic EH was first reported by Ishak et al. in 1984.3 Review of literature for hepatic epithelioid hemangioendothelioma, between 1984 and 2012 using PubMed, revealed approximately 200 reported cases. The etiology or risk factors are unknown, although it is most frequently seen in middle-aged women. Clinical manifestations are nonspecific.4 Diagnosing hepatic EH is fairly difficult for the radiologist because of its non specific findings. Ultrasonography reveals multiple discrete hypoechoic nodules or a diffusely heterogeneous echotexture of the liver. 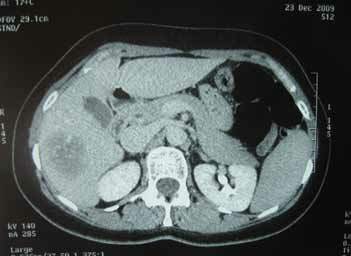 Computed tomography (CT) scan shows multiple discrete nodules with target appearance or a confluent hypodense mass in the liver. Magnetic resonance imaging (MRI) also shows low signal intensity lesions on T1W images and heterogeneous high signal intensity on T2W sequences. Peripheral enhancement and a thin non-enhancing rim are seen on gadolinium-enhanced MRI sequences.5,6 These features suggest a diagnosis of metastatic carcinoma, as also seen in the present case. The prognosis may vary widely, with some patients exhibiting slow-growing lesions and others presenting a rapidly progressive form.2 Orthotopic liver transplantation appears to be the only hope for patients with hepatic EH, since surgical resection is impossible due to the multifocality of the tumor.4 Recently, some authors have reported a malignant EH of the liver successfully treated with pegylated liposomal doxorubicin and metastatic hepatic EH successfully treated with thalidomide.10,11 In the present case, the choice of a right hepatectomy was done because the tumors were localized to the right liver, and also because liver transplantation is not available in Tunisia. Malignant epithelioid hemangioendothelioma (EH) is a rare tumor of vascular origin which usually occurs in soft tissues. In case of liver localization, it presents as multiple hepatic nodules. Orthotopic liver transplantation appears to be the only hope for patients with hepatic EH because of the multifocality of the tumor. Partial resection of the liver is possible for the localized tumor with good results. 1. Liu YI, Brown SS, Elihu A, Bonham CA, Concepcion W, Longacre TA, et al. Hepatic epithelioid hemangioendothelioma. Dig Dis Sci 2011 Feb;56(2):303-306. 2. Kim SG, Jung MK, Jeon SW, Cho CM, Tak WY, Kweon YO, et al. [A case of primary hepatic epithelioid hemangioendothelioma mimicking metastatic carcinoma]. Korean J Gastroenterol 2007 Jul;50(1):61-65. 3. Ishak KG, Sesterhenn IA, Goodman ZD, Rabin L, Stromeyer FW. 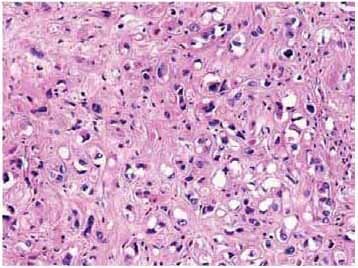 Epithelioid hemangioendothelioma of the liver: a clinicopathologic and follow-up study of 32 cases. Hum Pathol 1984 Sep;15(9):839-852. 4. Nudo CG, Yoshida EM, Bain VG, Marleau D, Wong P, Marotta PJ, et al. Liver transplantation for hepatic epithelioid hemangioendothelioma: the Canadian multicentre experience. Can J Gastroenterol 2008 Oct;22(10):821-824. 5. Chen Y, Yu RS, Qiu LL, Jiang DY, Tan YB, Fu YB. Contrast-enhanced multiple-phase imaging features in hepatic epithelioid hemangioendothelioma. World J Gastroenterol 2011 Aug;17(30):3544-3553. 6. Amin S, Chung H, Jha R. Hepatic epithelioid hemangioendothelioma: MR imaging findings. Abdom Imaging 2011 Aug;36(4):407-414. 7. Soslow RA, Yin P, Steinberg CR, Yang GC. Cytopathologic features of hepatic epithelioid hemangioendothelioma. Diagn Cytopathol 1997 Jul;17(1):50-53. 8. Gupta R, Mathur SR, Gupta SD, Durgapal P, Iyer VK, Das CJ, et al. Hepatic epithelioid hemangioendothelioma: A diagnostic pitfall in aspiration cytology. Cytojournal 2010;6:25. 9. Manucha V, Sun CC. Cytologic findings and differential diagnosis in hepatic Epithelioid hemangioendothelioma: a case report. Acta Cytol 2008 Nov-Dec;52(6):713-717. 10. Salech F, Valderrama S, Nervi B, Rodriguez JC, Oksenberg D, Koch A, et al. Thalidomide for the treatment of metastatic hepatic epithelioid hemangioendothelioma: a case report with a long term follow-up. Ann Hepatol 2011 Jan-Mar;10(1):99-102. 11. Grenader T, Vernea F, Reinus C, Gabizon A. Malignant epithelioid hemangioendothelioma of the liver successfully treated with pegylated liposomal doxorubicin. J Clin Oncol 2011 Sep;29(25):e722-e724.